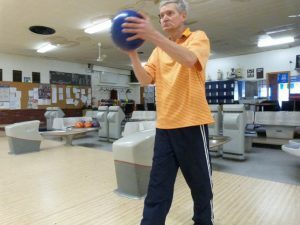 Check out everything we have planned for May for Community Living Month 2019! 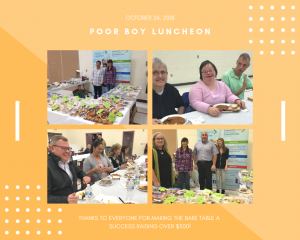 The CLC-K bake sale at the Poor Boys Lunch raised $532.00 Special thanks to Kent Phan, Marissa Druiett, and Paige Ashton-Padbury for volunteering. Thanks also to Stewart Street for assembling and assisting with the Bake Table. Visit the P4P planning Network site to view all the upcoming webinar offerings. 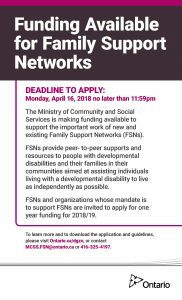 Partner Update_WebcastOffering_Fall_FINAL Watch out for the launch of the redesigned Planning Network which will include comprehensive guides on multiple areas of planning for families. 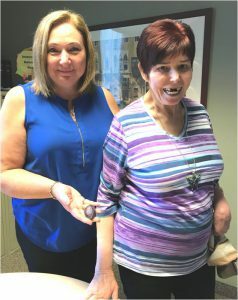 CONGRATULATIONS to Dayna Lovell who was the lucky Lottery Calendar winner of $500.00 on September 13th! 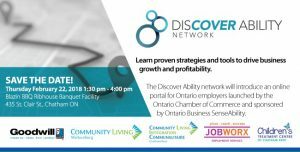 Celebrating Community Living Month 2018! 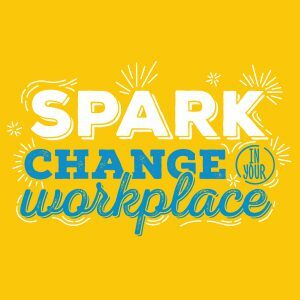 Check out everything we have planned for May – Community Living Month 2018! 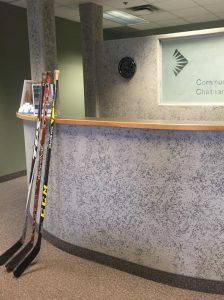 Community Living Chatham-Kent would like to extend our deepest sympathy to those affected by the Humboldt Broncos tragedy & show our support to these families. 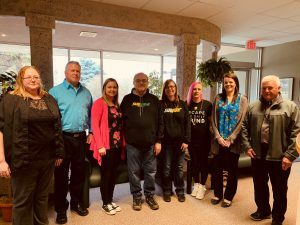 Community Living Chatham-Kent is pleased to announce that applications are being accepted for the Rob McLandress Make A Dream Come True Fund. 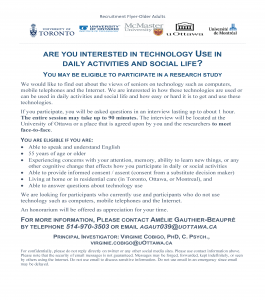 Visit Rob McLandress Fund to apply. 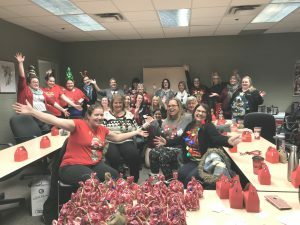 Employees from Community Living Chatham-Kent celebrated the season at their recent team meeting. 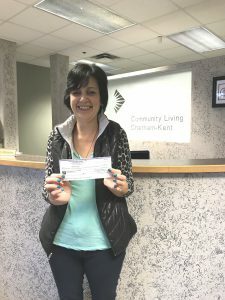 Congratulations to Robyn Calvert, winner of the Community Living Chatham-Kent Lottery Calendar draw on November 19, 2017. 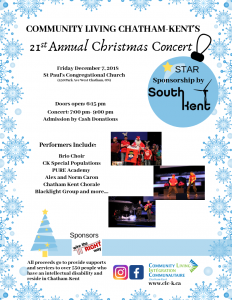 Community Living Chatham-Kent kicked off the Holiday Season by hosting a Tree Lighting Social on Wednesday, November 29. 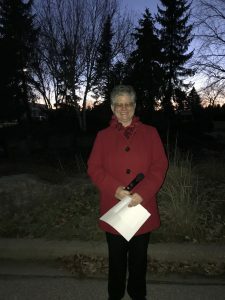 Leaders Within Graduate, Tracey, did a wonderful job inviting everyone to the celebration, and invited attendees to join together to sing Christmas Carols. Thank you to our community partner, Wright’s Electric, for their assistance. 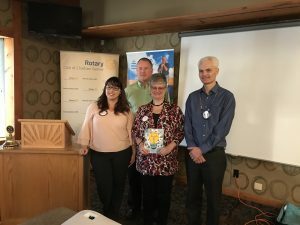 Community Living Chatham-Kent was proud to speak at the Rotary Club of Chatham Sunrise today. 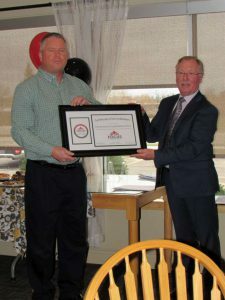 Featured was information about the wonderful work within our agency, and how Community Living Chatham-Kent works with and supports the Rotary Club of Chatham Sunrise. .
Community Living Chatham-Kent received a Certificate of Accreditation from FOCUS Accreditation presented by Brian Dunne (Focus Board Member) to Ron Coristine, Executive Director, Community Living Chatham-Kent on Nov 16th. 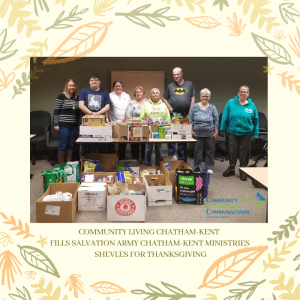 Community Living Chatham-Kent Board of Directors, and employees shared in the celebration. 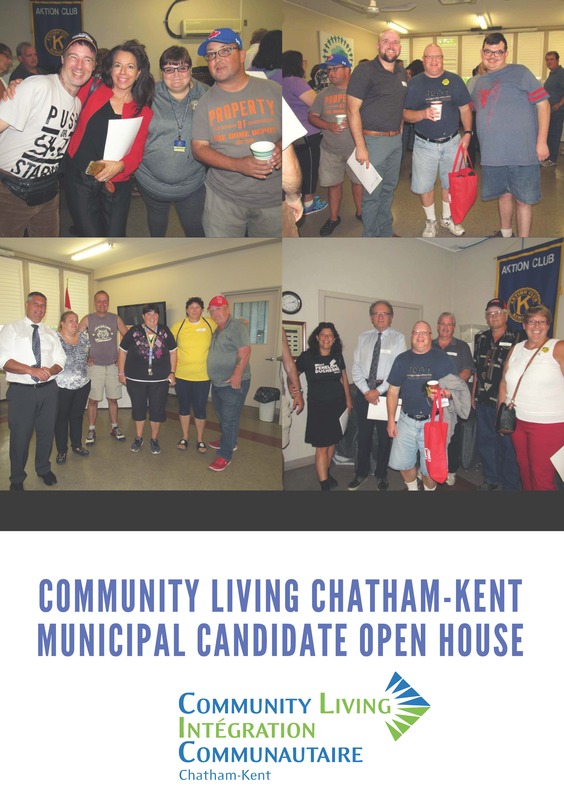 Thank you to the Chatham Maroons Organization for hosting Community Living Chatham-Kent Night on Sunday, November 12, 2017. 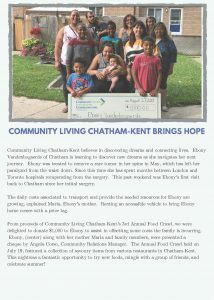 We were thrilled to sell our Lottery Calendars, as well as build awareness about Community Living Chatham-Kent. 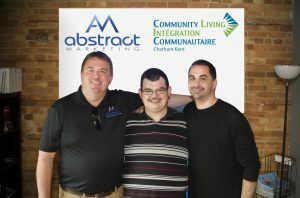 Thank you to our valued Volunteers, Derek and Brett, for their help! 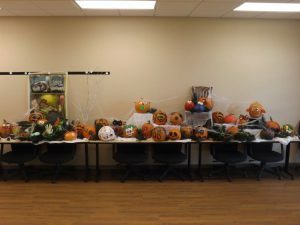 Many thanks to Thompson’s Orchards donating forty pumpkins to the Day Program on Sass Road! People who attend the Day Program were able to make jack-o-lanterns which were used to decorate the program. Each person will take their personalized pumpkin home for Halloween. 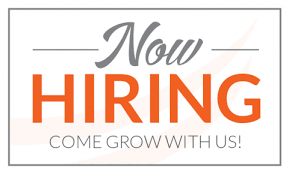 NOW HIRING DIRECT SUPPORT PROFESSIONALS We are growing and there will be several positions available. If you are interested in a career with a progressive agency please apply. 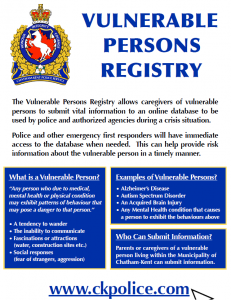 For more information visit the Career page on our website. 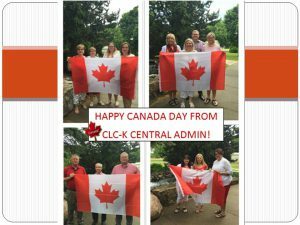 CLC-K Hits A Home Run! 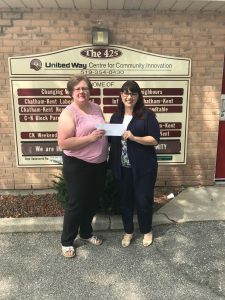 Community Living Chatham-Kent’s JOBWORX – Employment Services, Jaycee Park Canteen donated $200.00 to Chatham-Kent Minor Baseball Association in recognition of our community partnership. 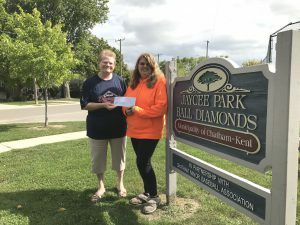 Pictured are Lisa Luyt-Dozois, Umpire Assignor/Tournament Coordinator and Liz Caron- Ranger, Canteen Staff. 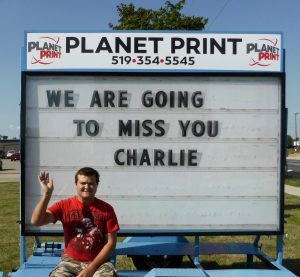 Charlie enjoyed spending Monday’s and Wednesday’s at Planet Print. 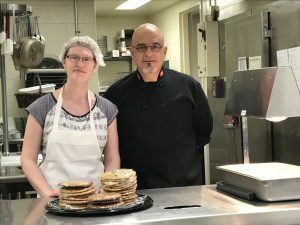 Charlie is going back to school, but is grateful for the opportunity. Thank you, Planet Print! 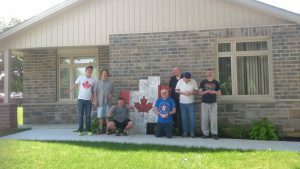 Special moments from Canada Day July 1, 2017. 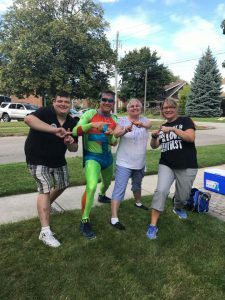 Do you enjoy receiving our Community Connections Newsletter, learning about our fundraising efforts and events, being informed about Volunteer opportunities, and receive information on how you can leave a legacy gift to Community Living Chatham-Kent? 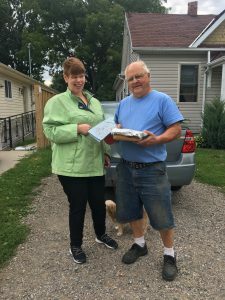 Subscribe to our mailing list providing your consent to receive electronic information from Community Living Chatham-Kent. SUBSCRIBE HERE. Thank you to everyone for your continued support. 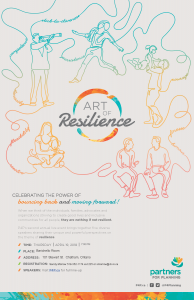 We are looking forward to Thursday, July 20! 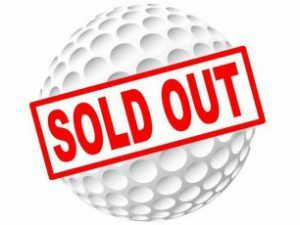 We are thrilled to announce our 20th Annual Golf Tournament is SOLD OUT! 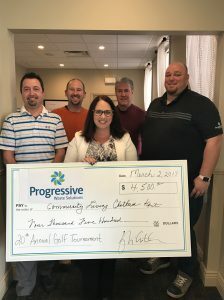 Thank you to all the golfers, sponsors, and prize donors. 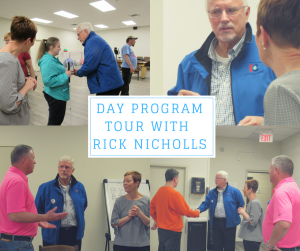 We are looking forward to Saturday, June 3 at Deer Run Golf Course. 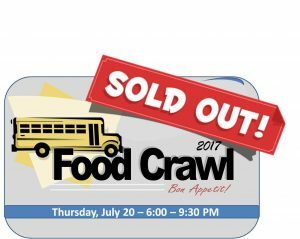 Food Crawl Tickets on Sale Monday, May 15!! Tickets for the 2nd Annual Food Crawl is quickly approaching!! 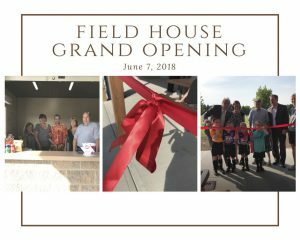 Mark your calendars for Monday, May 15 at 10:00am! Purchase online at FOOD CRAWL TICKETS. 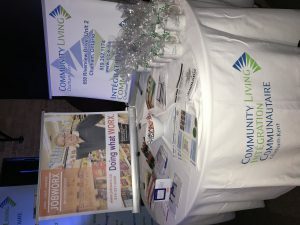 May is Community Living Month! 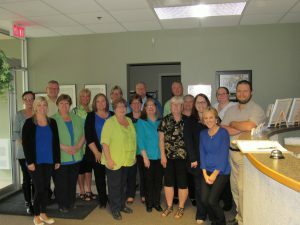 To celebrate, the Central Admin Staff wore green and blue. 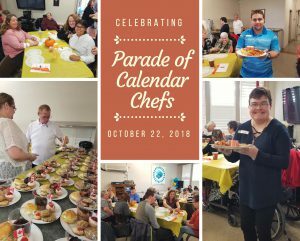 The month celebrates the accomplishments, gifts, and talents, that people who have an intellectual disability, bring to their community. Raffle Ticket – Great Prizes to be Won! 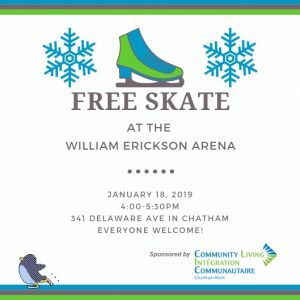 The 2017, Community Connections newsletter is now available for viewing! 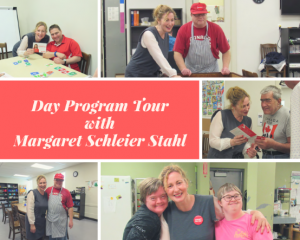 Exciting things are happening at Community Living Chatham-Kent! 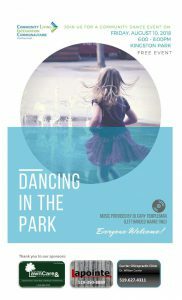 Download Volume 1 today! 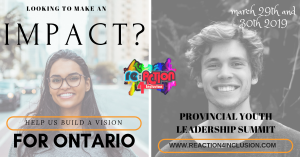 Community Connections Newsletter If you would like to subscribe to our newsletter, simply send an email to info@clc-k.ca with the subject line “Subscribe to CLC-K Information E-Mail List”. March 21, 2017, was World Down Syndrome Day. Enjoy this video! Congratulations to Sue Marchand who won the $500.00 February 14th draw, from the 2017 Lottery Calendar. Please find a list of all winners by visiting the Lottery Calendar page. 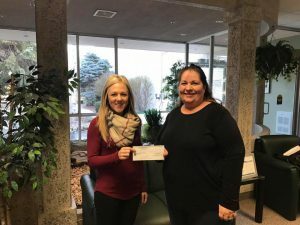 Congratulations to Bonnie Inns who won the $1000.00 January 1st draw, from the 2017 Lottery Calendar. Please find a list of all winners by visiting the Lottery Calendar page. 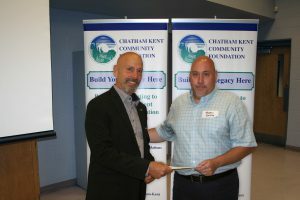 Community Living Chatham-Kent is pleased to announce the recipients of the Jonathan Daniel Stone Fund. 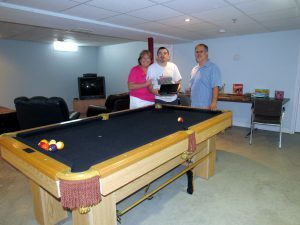 Each recipient received a $1000.00 award to assist with the achievement of their initiative. The awards were presented on Thursday, December 22, 2016. 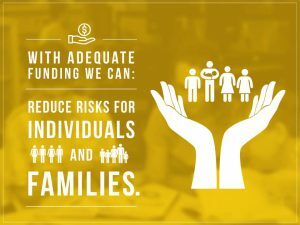 Please visit http://www.clc-k.ca/donate/jonathan-daniel-stone-fund/ to read about the 2016 recipients. 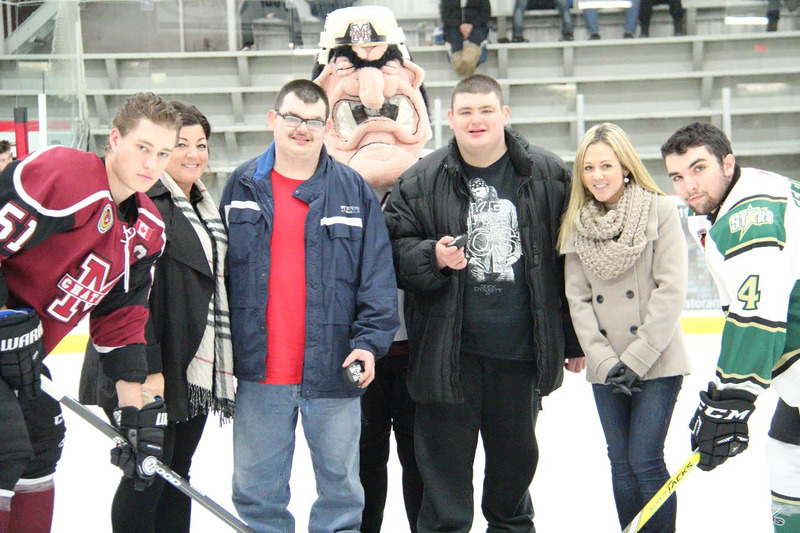 Sunday, December 11 was Community Living Chatham-Kent Night at the Maroons Game. 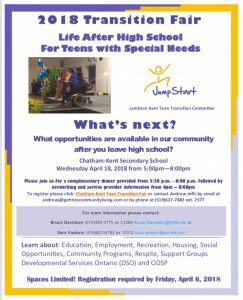 The Chatham Maroons have been a great partner and are Sparking Change and Inclusion in the community. Thank you to the Maroons Organization for your support. Please be advised the Central Administration building (650 Riverview Drive) is temporarily closed and will re-open Thursday, December 15, 2016 at 8:30 am. 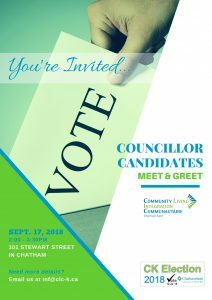 Join us on November 17 from 3:00 pm – 7:00 pm for the Annual Stewart Street Bazaar, located at 101 Stewart Street, Chatham. Craft vendors, bake goods, cosmetics, homemade jams, jewelry, scarves and so much more await your shopping pleasure! “Penny Sale” is back! Don’t forget to pick up your 2017 Lottery Calendar!